My friend requested an armband to hold her ipod while she works out. This is what I came up with. 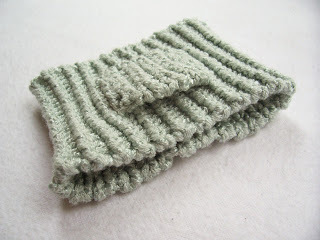 The yarn's inherent elasticity, coupled with a twisted rib, makes this very stretchy to fit a variety of arm sizes. The pocket was designed to hold a 2nd generation ipod shuffle, but could easily be made bigger or smaller to accommodate your favorite music device. CO 50 sts using long-tail tubular cast-on (or any stretchy cast-on you like). Join and work k1 tbl, p1 ribbing for 20 rounds (after foundation rows if you used the tubular CO). BO all sts using tubular bind-off (or stretchy bind-off method of your choice). CO 10 sts with tubular cast-on. Work foundation rows. Next RS Row: sl1, [k1 tbl, p1] 4 times, k1. Next WS Row: sl 1, [k1, p1 tbl] 4 times, k1. Repeat these two rows 4 more times. BO using tubular bind-off, leaving a long tail. With BO tail, sew pocket onto band along three sides. Weave in ends. Go rock out on the treadmill. This is PERFECT for my friend, thanks so much for sharing! I'll be linking. Carissa your socks make me cry because they are sooo beautiful. l can never knit them. Your color choices are amazing !!!. I have to check out your Etsy Store for sure. THANK YOU so much for this tutorial! 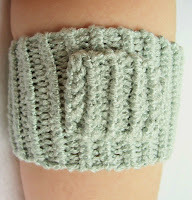 I am not a knitter but I saw this and whipped up a fast armband using this as inspiration (using an old knit sweater sleeve) in under 45 minutes! Now I have a fabulous and unique armband to use today when I work out. I am thinking of adding a patch or something to add interest, but it's awesome as is! Thank you again, you are great!